Tenderness is typically regarded as the most important characteristic affecting the palatability of meat. Irrelevant of the type or cut of meat, the slower meat is cooked the tenderer it will be. The tradeoff is the slower we cook meat the longer it takes to get done. A piece of meat will lose 20 percent or more of its size during cooking due to moisture loss. When we cook meat for tenderness it is imperative to cook the meat in a way that will liquefy the connective tissue, called collagen. Slow cooking can turn even the most economical cuts of meat into a melt-in-your-mouth treat. This is because less-expensive cuts of meat contain larger amounts of collagen that require longer cooking times at lower temperatures for the collagen to dissolve. The breakdown of collagen is called “denaturing,” a process that transforms the tissues at the molecular level. Meat is essentially muscle, and collagen is the tissue that holds the muscles together. The collagen begins to melt and becomes a rich, gelatinous-like liquid at roughly 160 degrees Fahrenheit. When collagen is broken down properly it imparts an amazing silky-smooth texture, as well as tenderness and flavor, to meat. Calpains, which are protein enzymes, is a second consideration we must take into account when cooking meat. Calpains enzymes work to break down muscle fibers during the aging process but also become active during cooking. However, the longer we exposed meat to heat the more moisture it will lose. As meat dries out it becomes harder for us to chew. To ensure all illness-causing bacteria, such a salmonella and botulism, are killed off, different types of meat all have safe recommenced cooking temperatures. This is where an instant-read meat thermometer like the Thermopro food thermometer can be very helpful. Calpains enzymes become most active at temperatures between 80 and 105 degrees Fahrenheit. Because enzyme activity increases between those temperatures, calpains produce an “aging” effect during the cooking process. Beef will begin to turn pink as heat-sensitive fibers begin to denature. 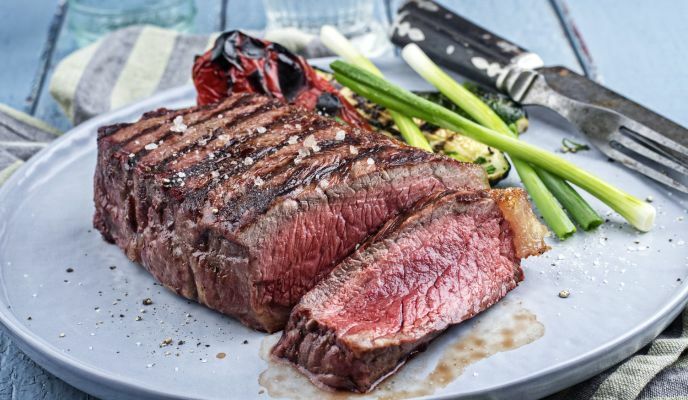 Even though it has not reached the safe minimum cooking temperature, “rare” beef is typically removed from the heat at this point and juices will readily flow when sliced. Additionally, because we have not allowed the meat to reach the magical 160-degree collagen-melting point, rare beef is not the tenderest. Denaturing of collagen begins. The meat turns from a light pink to brownish grey in color and begins shrinking from the loss of juices. Meat cooked to this temperature is consider “medium rare”. Collagen starts to dissolve at 160 degrees and is fully dissolved at 180 degrees, with fall-off-the-bone tenderness. At this point, the meat is dryer, from losing a lot of moisture, but is as tender as meat can get. We considered meat cooked to “medium” at 160 degrees and “well done” at 180 degrees Fahrenheit. Beef: 145 degrees Fahrenheit minimum with a three-minute rest period before carving. Ground beef should be cooked to an internal temperature of 160 degrees Fahrenheit with no rest period needed to eliminate the risk of E-coli and salmonella bacteria. Poultry: 165 Fahrenheit with a three-minute rest period before carving for all fowl, including ground poultry products. Pork: 145 Fahrenheit with a three-minute rest period before carving. We should cook ground pork to an internal temperature of 160 degrees Fahrenheit with no rest period to eliminate the risk of E-coli and trichinosis. Veal: 145 Fahrenheit with a three-minute rest period before carving. Ground veal should be cooked to an internal temperature of 160 degrees Fahrenheit, with no rest period needed. Mutton: 145 Fahrenheit with a three-minute rest period before carving. Ground mutton to an internal temperature of 160 degrees Fahrenheit, with no rest period required. Seafood: 145 Fahrenheit with a three-minute rest period. While many of us eat fish raw, reaching the safe-cooking temperature will eliminate the risk of parasitic infections. Because the internal temperature of the meat is so critical to achieving both tenderness and eating safety, an instant-read meat thermometer like the Thermopro TP18 food thermometer is a must-have for us to know exactly when the optimal tender meat temperature has been reached. A good instant-read thermometer must be accurate, as just a few degrees difference in temperature can make a big difference in meat tenderness and safety. A good instant-read thermometer must be able to give us readings in just a few seconds, so as to minimize heat loss during temperature reading. Keeping these two criteria in mind when choosing a meat kitchen thermometer, as well as the optimal cooking temperature guideline, will guarantee all our cuts of meat will be cooked to perfection. These methods include roasting, frying, and grilling. While dry-heat tends to add a nice char and flavor to the meat, it also causes the meat to dry out more. Contrary to popular belief, adding moisture to the meat while cooking will not prevent moisture loss, but it will slow the process down. Moist-heat cooking includes steaming, poaching and sautéing. Steaming involves covering the meat so it will be batched in its own steaming juices while cooking. Poaching essentially involves simmering the meat in a pan with just enough water to keep the meat covered. Sautéing is similar to poaching, but uses a flavored liquid like a broth, barbecue sauce, cream or butter instead of just water. Irrelevant of the cooking method, it is critical for us to control cooking temperature to achieve optimum tenderness. The trick to tender meat, with any cooking method, is to bring the temperature up to the recommended safe-cooking point as slowly as possible, without overcooking the meat. This entry was posted in Knowledge and tagged Cook Tender Meat, Safe Meat Temperature.